Carbide mining lamp with wick, and oil lamps. 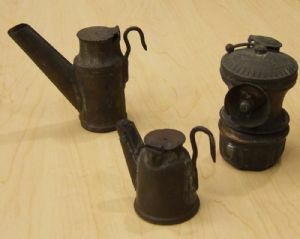 The smaller of the coal oil lamps belonged to the grandfather of Bill Richmond. His grandfather worked for 35 years in the mines. The other coal oil lamp and the carbide lamp belonged to Robert Brown. One lamp belonged to James William Richmond who lent it to the George's Creek Library. The photograph was taken with Mr. Richmond's permission.